SEO tactics have one thing in common, they are all following the mission to reach the finish line in front of everyone else. Time to justify if we have settled our KPIs as a marketer to see if we have succeeded or not. CARDINAL: 12 Local Search Trends You Can No Longer Ignore in 2019, Click Here. Forbes: The Easiest SEO Tactics You Can Implement Today, Click Here. Backlink O: 21 Actionable SEO Techniques That Work GREAT in 2018, Click Here. Single Grain: The 10 Most Powerful SEO Tactics for 2018, Click Here. Unicorns, frog princes and businessmen who do not want website traffic have one thing in common – they are all imaginary. We are yet to meet an entrepreneur, who does not have the desire to boost his website traffic. Organic traffic is a direct indicator of a business’ reach, popularity and prosperity. Sadly, only about 25% of all business owners are proactively engaging in SEO boosting activities. This signifies a start dissonance between fantasy and reality once again. Why is optimization of your website UX important for site performance? Every small aspect of your website can affect the way your users interact with it. The dominant colors, the header placement, use of fixed header panels, placement of sidebars and the basic choice of CTAs can directly influence your website performance. How your users interact with your website elements and how your visitors behave on your page directly reflects on your website performance. The focus of website metrics has shifted to user experience (UX) over the last couple of years. So, it is no surprise that people do not want to visit websites or buy from e-commerce sites that look cluttered. When human users like the way you have decked your site, they are more likely to place orders. Navigating through your website should not only be comfortable for the search engine bots, but it should also be a pleasurable experience for your human users. In fact, search engine giant, Google, is updating its algorithm to humanize the bots and determine the quality of UX each website can provide. For a website owner, it might become a little confusing to understand how well their website is performing following certain updates or changes. You can keep your eyes on a few key performance indicators or KPIs to understand how your human users are responding to new changes or the lack of it. Google keeps an eye on a website’s dwell time to understand the quality of UX it is providing to the user. If the user goes to a site, bounces back 30 seconds later to the main SRL page and clicks on a competitor link, it signifies poor UX and reflects badly on the ranking factors. How often do your target users click on your website link on the Google SRL? It might be a significant indicator for PPC campaigns, but it is also crucial for websites. CTR determines how well the meta description represents the actual content of the ranked webpage. If the description is off-point, the visitors quickly bounce back and start browsing competitor links for better information. Therefore, CTR serves as a direct KPI of website traffic and traffic quality. This is a part of off-page SEO that involves keyword research and content quality. If you do not construct the correct meta description for your article/blog, you can end up targeting the wrong users or completely missing your target crowd. You need the right blueprint SEO strategy to improve your CTR as well as your Dwell Time. Just because two or more key performance indicators tell you how your website is performing, you should not give in to the temptation of lumping them together. 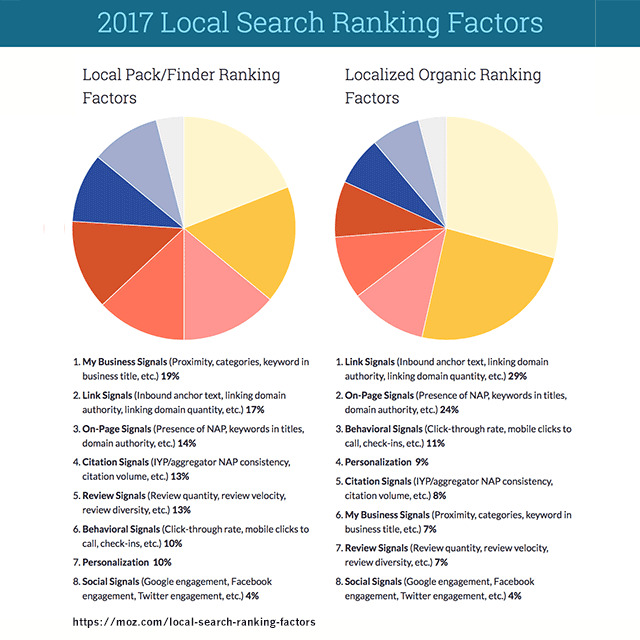 Google Local SEO has its ranking factor analysis and strategy. Hyper-local search result optimization depends on a plethora of factors including keyword optimization for local users, proximity signals, inbound anchor text, link domain quality and authority, the inclusion of NAP, review quality, CTR, social media engagement and mobile click-to-call. These are the behavioral signals that have the power to determine the future of your website revenues. Among all ranking factors, my business signals comprise 29% of the influencers and on-page signals closely follow with 24% dominance. Among all organic ranking signals, social signals contribute to only 4%. Other interactions including direct social media shares, comments, and a subscription to newsletters and RSS are also key performance indicators of a website. However, modern SEO experts and strategists believe that they are not as strong as the first 3 KPIs discussed here. To know how well your company is performing against your competitors, you need to track at least the 3 KPIs we have mentioned here. Tell us how you plan to monitor these metrics right here. Search engine providers keep us busy with their algorithm changes all the time and this makes us playing catch up all the time. Let us know how your SEO changed in 2018 and which SEO tactics you have tried to succeed in your mission. Use our commenting section below to start the conversation with your peers. Very nice blog . And blog posts also . Very interesting topics. We have daily a fresh blog for you, read about Digital Marketing, Technology, Business, Lifestyle and nice Infographics, sign up now!! !